Titan Enterprises' 800, 900 and 1000 series flowmeters can now be fitted with a pre-scaler which is programmable to suit customer requirements. This new flowmeter mounted electronic package gives a scaled frequency output proportional to flow. 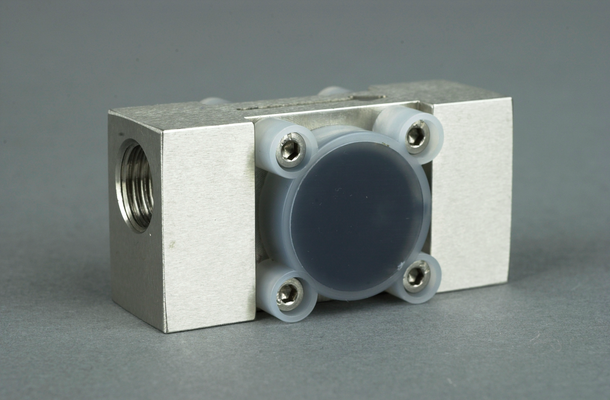 The pre-scaler board fits inside the flowmeter housing and receives the pulses directly from the sensor. After flow calibration the current 'K' factor and the desired 'K' factor are entered. This output value can be the same for all flowmeters in a batch enabling total interchangeability without recalibrating the associated instrumentation. Any K factor less than the meters calibrated value can be used, if required Titan can re-program the meter at any time. Beneficially the pulse width of the output pulse on the pre-scaler is also fully programmable. The pre-scaler circuit board is supplied encapsulated in the flowmeter housing thereby ensuring that the sensor assembly is fully protected from the surrounding environment. The meter uses a four wire system with the same flying lead being used for both programming and customer connections. This simplified approach ensures the integrity of the encapsulation and terminations. The 800-, 900- and 1000-series flow turbine meters are designed to give reliable, high performance with up to 7 flow ranges from 0.05 to 30 litres per minute. Incorporating chemically resistant components make these meters fitted with pre-scaler the right choice for the metering of a wide range of fluids from 0°C to +50°C.